I love recipes with minimal ingredients. These 3 ingredient thumbprint cookies are so easy to make! They can be made in less than 20 minutes! 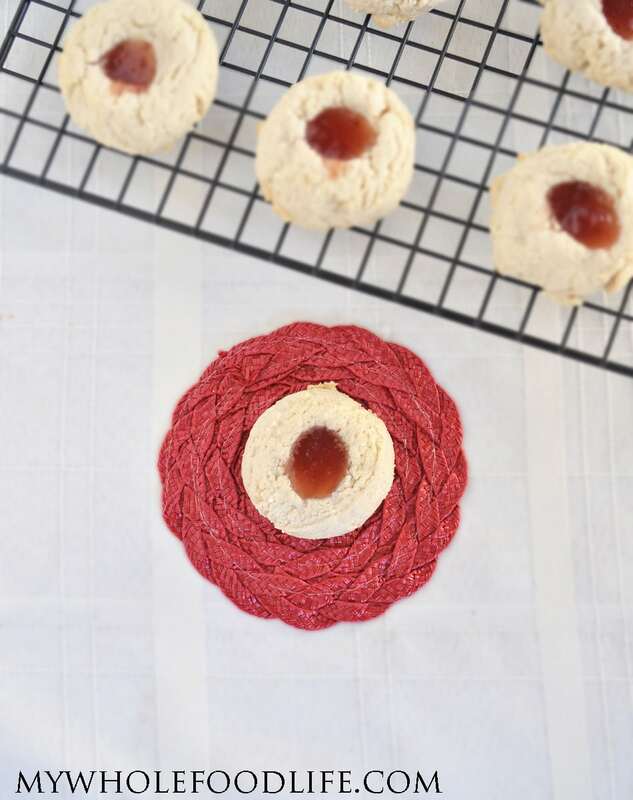 These 3 ingredient thumbprint cookies would be great for cookie swaps during the holidays. I used raspberry jam in mine, but you can use any jam you like. I think these thumbprint cookies would be great with my blueberry chia jam too. Yum! These healthy thumbprint cookies are flourless, vegan, gluten free and paleo. If you have someone with a nut allergy in your house, you can use sunflower seed butter in this recipe as well. Or if you prefer almond butter or peanut butter. I think the peanut butter would give it a pbj&j feel. Yummy! I chose cashew butter because it is buttery in texture and mild in flavor. I made my own cashew butter, but grinding up some cashews in the food processor for about 10 minutes. You can also use store bought cashew butter if you like. All you need is 3 ingredients and less than 20 minutes to make these cookies! In a food processor , combine the cashew butter and maple syrup. Once blended, drop cookies onto a lined baking sheet . I used a cookie scoop for mine. Once all the cookies are on the sheet, use your palm to flatten each one. Fill the thumbprint with jam. It's very important to let these cookies cool completely before removing them from the baking sheet. Store these cookies in the fridge. They should last a couple weeks that way. You can also freeze them for longer storage. Enjoy! A lot of your recipes call for maple syrup. A lot...... and I ran out. Agave is a little thinner, honey a little thicker. Have you ever substituted? Maybe coconut syrup.? Any tips until I can buy some? Any sweet syrup will work. I just prefer the maple syrup. If you use sunbutter, will they turn green? No. I think that only happens when you add baking powder/soda. I hope you enjoy the recipe Amy! LOL. I learned the hard way too. I keep hearing about this cashew butter, I have to try it now. These sound and look good, and super easy. Thanks Christina! You will love cashew butter. So good and versatile too. Cashew butter is one of my favorites. Plus, a little fruit jam with it, how much better can it get?! This is a must try!! Mine too. It's divine with the jam! What are the amount of calories..sugar, carbs etc? Oh yum! Let me know what you think! Yay! So glad you enjoyed them! I think on my next batch, I will try to add a tiny bit of almond extract. I think it would be yummy too! These are soooo delicious and fun to make with my daughter! I love the simplicity of 3 ingredients! We eat paleo-style, and while I sure do love and appreciate all those paleo bloggers out there, it's nice to try some recipes from a little different perspective. Thank you, Melissa!! So glad they worked with almond butter! Do you brown rice syrup would work in lieu of maple syrup in all your cookie recipes? Thank you! I was just wondering when you add the maple syrup with the cashew butter does it form a cookie dough? I’m going to try this recipe for Christmas and I’m not sure if this will work thanks!